CVT is a transmission that can change seamlessly through an infinite number of effective gear ratios between maximum and minimum values. The CVT type of transmission's "gear ratios" automatically change within the limits of the system, to any random setting. It’s not constrained to a separate series of specific ratios such is typical of motorcycle transmissions. As a result, accelerating with a CVT is incredibly smooth uninterrupted process. 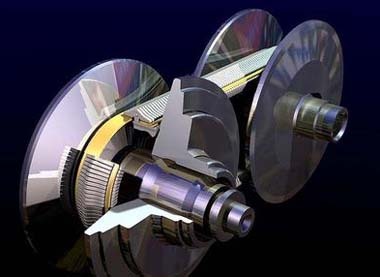 You can indeed say that a CVT has countless numbers of "gears" that it can run through at any time, at any engine or vehicle speed—and this makes it easy to go faster than you realize! When accelerating, the engine at first revs up to its comfortable RPM (revolutions per minute) range and then remains there while acceleration continues as the ratio changes to make wheel RPM faster while engine RPM remains the same. The whole driving force in this system uses a belt between two pulleys—the effective radii are variable, changing according to the speed of the scooter; one radius increasing while the other decreases, accommodating its constant belt length. 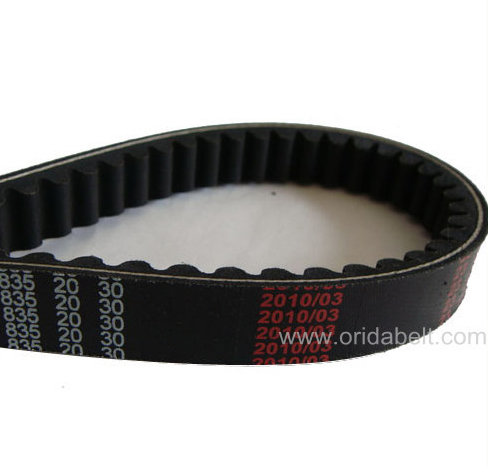 These belts stretch over time and as they loosen, slip and fail to transmit power to the wheel. 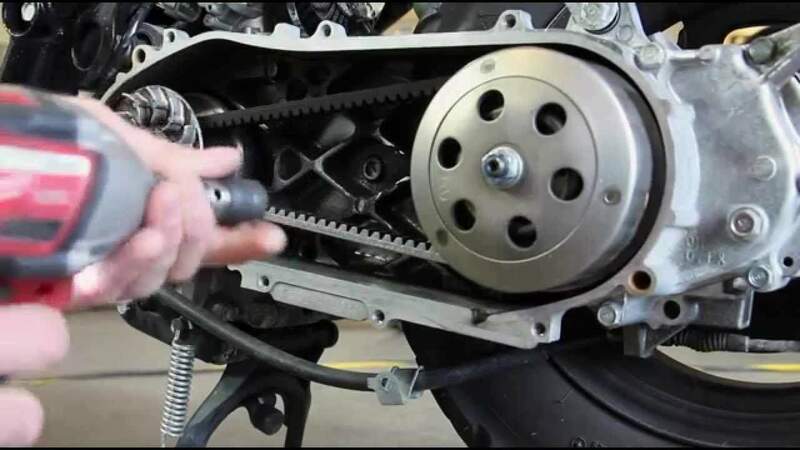 Belt replacement is a standard maintenance task of the CVT powered motorbike. The CVT is also, aside from usual lighter weight of the scooter, the reason you’ll get much better fuel economy than the usual motorcycle transmission. The CVT enables the engine to run at its most efficient RPM for a range of vehicle speeds. This is achieved because the driving shaft maintains a constant angular velocity over a range of output velocities. There’s one challenge the CVT presents versus the standard manual motorcycle transmission –if you’ve got a dead battery you won’t be able to “bump start” your CVT driven motorcycle. Even though scooters are generally equipped with a kick-starter along with its electric ignition, it still won’t help in the case of a truly dead battery. In motorcycles, the belt-type CVT, which excels in the balance of weight, performance and cost, has been used for a long time predominantly in scooters for the purpose of easy driving. 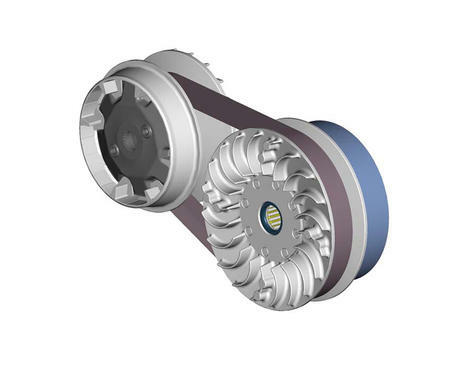 In conventional belt-type CVT, the centrifugal force of the weight rollers in the drive pulley located on the crankshaft acts on the ramps and presses the moveable drive face against the drive belt in the axial direction. 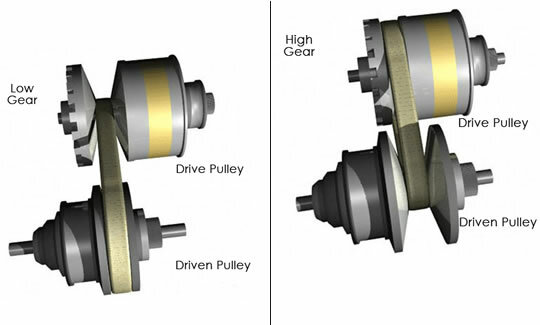 The belt-pitch diameter on each pulley changes depending on the balance between the above-mentioned side force in the drive pulley and the side force in the driven pulley that occurs from the spring load and the torque cam that detects the driving force of the rear wheel causing the reduction ratio to change. However, as the shift characteristics are determined solely by mechanical factors, it is difficult to liberally adjust the reduction ratio for each level of throttle opening to attain the best balance of clean exhaust gas, fuel economy, quietness and driving performance. Also seen is such a phenomenon that as the belt wears over time, the pitch diameter becomes smaller in the drive side and larger in the driven side, resulting in a loss of maximum speed due to a change in the reduction ratio.